We hope you have had the chance to start the 5 Step, 5 Canter, 5 step exercise because it's time to add to the exercise. This next exercise is part 2 of the three part series on Improving the Canter. Watch and learn how it takes just a little extra to build on an already existing exercise. If you do this exercise right you will see a big improvement with your horse over a short period of time. If you want to follow along with the book please click here to order your manual today. This video clip is the last of the three part series; Improving the Canter. Now don't worry, this isn't the end of Kenny's instruction!! 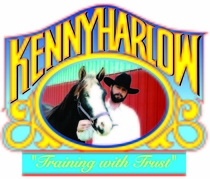 He has a whole line of exercises, training sessions, and tips that are geared to the canter and other equestrian disciplines!